OMAHA, Neb — There won’t be an Orange and Blue dog pile at TD Ameritrade Park in 2018. 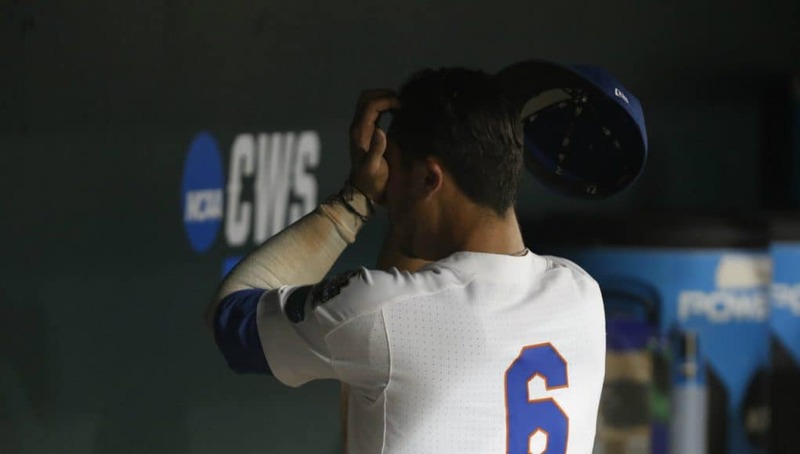 The Florida Gators’ season ended Friday night after a 5-2 loss to Arkansas, who advanced to the College World Series Final for the first time since 1979. 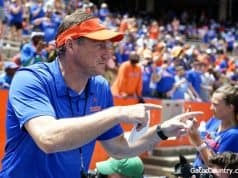 Kevin O’Sullivan and the Gators lost their first game in Omaha before taking the next two to advance to their third CWS semifinal in the last four seasons. O’Sullivan turned to Brady Singer, his ace and the National Player of the Year to face the Hogs. Singer’s history with Arkansas was rocky, he entered with an ERA north of 14 in two starts but when your ace asks for the ball it’s hard to say no. Arkansas jumped on Singer early. Casey Martin (4-5) singled and advanced to second on a long fly out. Luke Bonfield drove him in with a single to right center. Singer threw a zero up in the second but Martin was back at it again in the third. The freshman led the inning off with a single to left field. Heston Kjerstad reached on an error, which moved Martin to second. Dominic Fletcher singled to right to plate Martin. Meanwhile Arkansas starter Isaiah Campbell was cruising. The sophomore was lit up in Gainesville earlier this season to the tune of six runs, five earned in just one inning of work. Friday night he carried a perfect game into the fifth inning. Arkansas extended its lead to 4-0 in the fifth inning. Martin doubled to start the frame and then came around to score two batters later. Dominic Fletcher launched a solo home run over the visitor’s bullpen and into the stands in right field after that. Florida wouldn’t just lie down. Austin Langworthy broke up Campbell’s perfect game with a two-out single in the bottom of the fifth. Blake Reese was hit by a pitch and Brady Smith drove in Florida’s first run with a single back up the middle, advancing Reese to third. Reese scored on a wild pitch to halve the Razorback lead. Singer’s start was doomed from the beginning. Starting on just four days rest the junior needed 29 pitches to get out of the first and 20 more to get out of the second. By the end of the third inning he had already run his pitch count up to 65 and when he walked off the mound in the fifth inning with 89 pitches O’Sullivan made the move to go to his bullpen. Freshman Tommy Mace stepped on the mound in the sixth inning and pitched well. His defense let him down, and Arkansas scored an unearned run in the frame but not because of how Mace threw. The freshman finished the game out throwing four innings of four-hit baseball with four strikeouts. 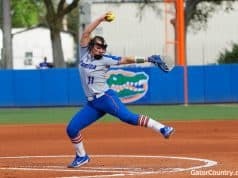 The Gators weren’t able to string anything together the rest of the way, managing just three hits. 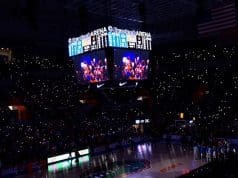 Florida’s junior class finishes their career 153-56 and JJ Schwarz, Florida’s only four-year senior, finishes his career 205-74.